The Croatian enclave of Dubrovnik is sandwiched between the turquoise waters of the Adriatic and the rugged weathered karst topography of the Dinaric Alps. 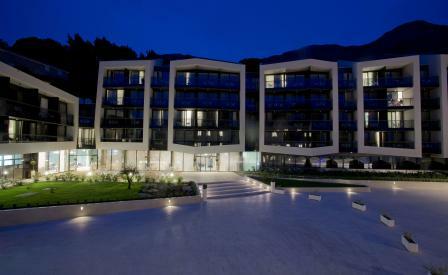 These together inspire both the architecture and interior design of the newly built 85-room Hotel Mlini. Mimicking the broken patterns of these cracked cliff faces, Zagreb-based architects Siloueta have created a chain of de-constructivist limestone-clad volumes for the hotel. This is the backdrop for Villa Jelić, a restored stone building with a terracotta roof that is home to six of the hotel’s suites. Reflective of the local urban typology of irregular structures, the hotel and villa cluster around a new plaza for the village of Mlini, named after the flourmills powered by the Vrelo stream that borders the hotel as it enters the Adriatic. London-based interior designer practice Scott Brownrigg have developed the elemental qualities of the landscape into a pattern of random geometric lines in the petroleum blues of the Adriatic for wall-coverings and carpeting. Enhancing this authenticity, commissioned artwork from Galerija Canvas of Zagreb and young Croatian artist Josipa Šćapec reflects the refracted patterns of green-blue light on waves. From faceted ceilings hang small constellations of mirror ball pendant lamps that complement the Cubist-light approach of the overall design. Manufactured by Dekor from Zabok, northern Croatia, the lamps are steeped in local design heritage from the 1980’s and are a precursor to those by Tom Dixon. Watching the setting sun is a favourite local pastime to be appreciated from either the terrace of the hotel’s osteria Agava, or guestroom balconies.